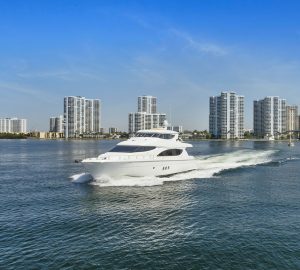 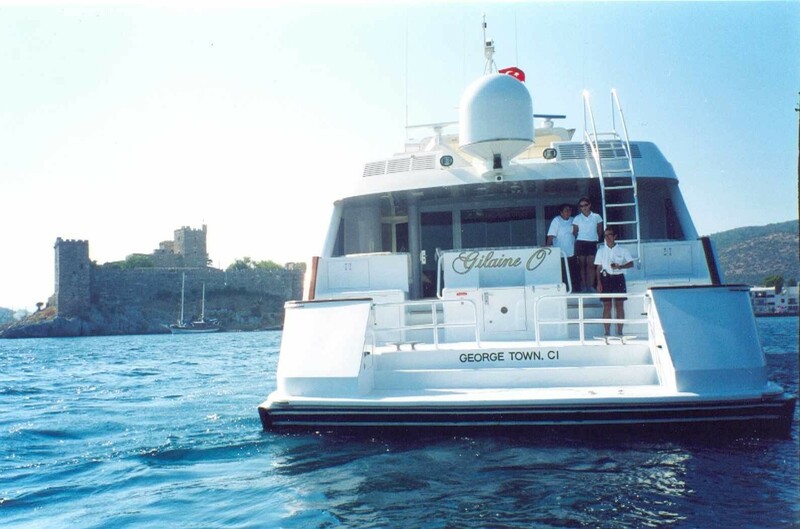 Luxury motor yacht GILAINE O was built by the Hatteras Yachts Shipyard in 1992, she measures 34.4m (112ft) and offers deluxe charters in the East Mediterranean. 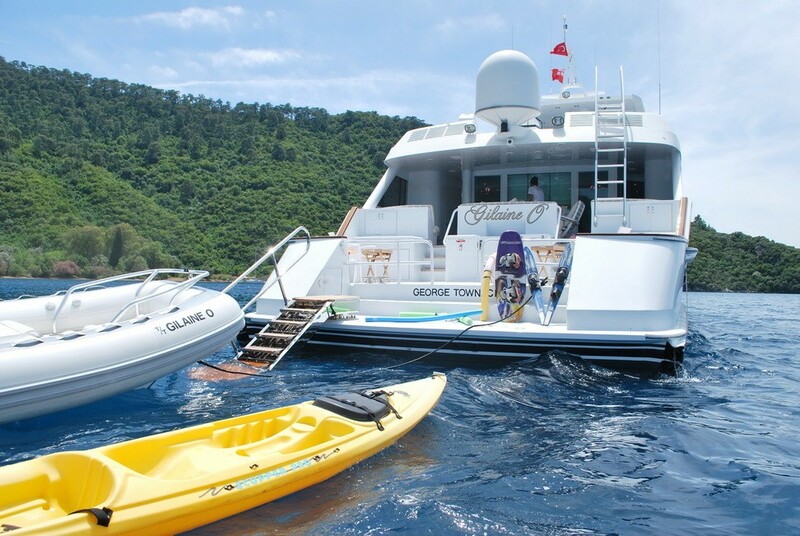 M/Y GILAINE O can accommodate up to 8 charter guests, in 4 en-suite cabins. 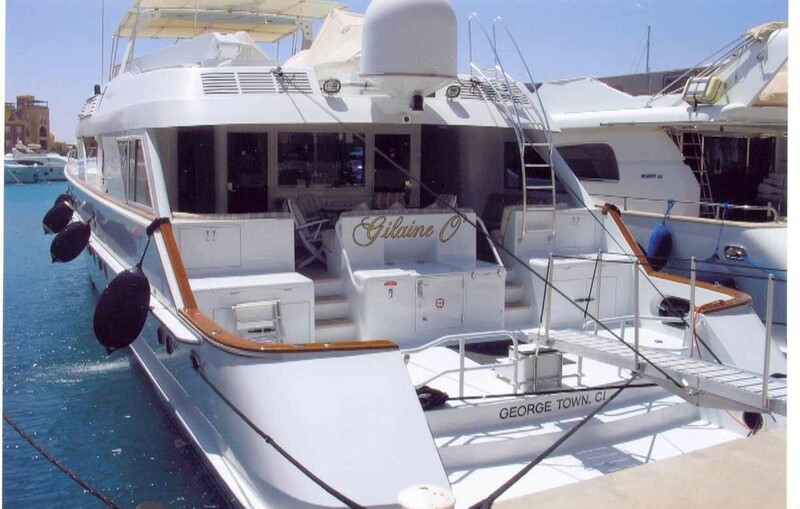 Crewed charter yacht GILAINE O received an extensive refit in 2007 and is the perfect yacht for families and friends, who wish to explore the idyllic Greek and Turkish waters in style. 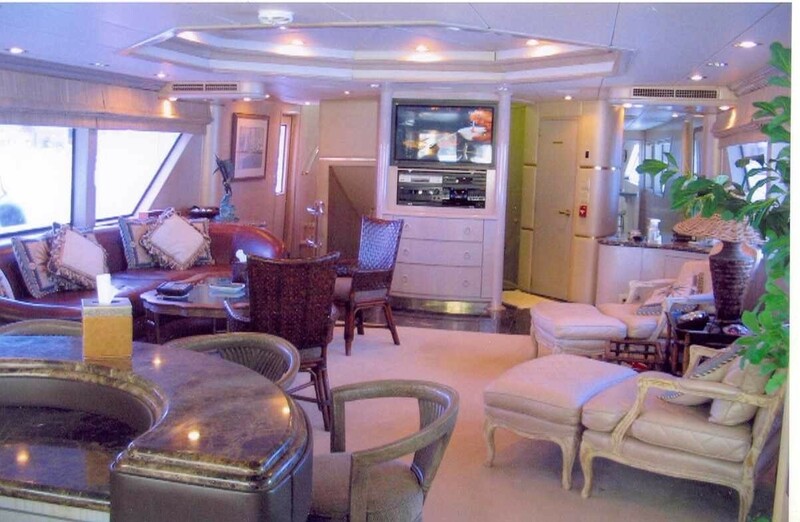 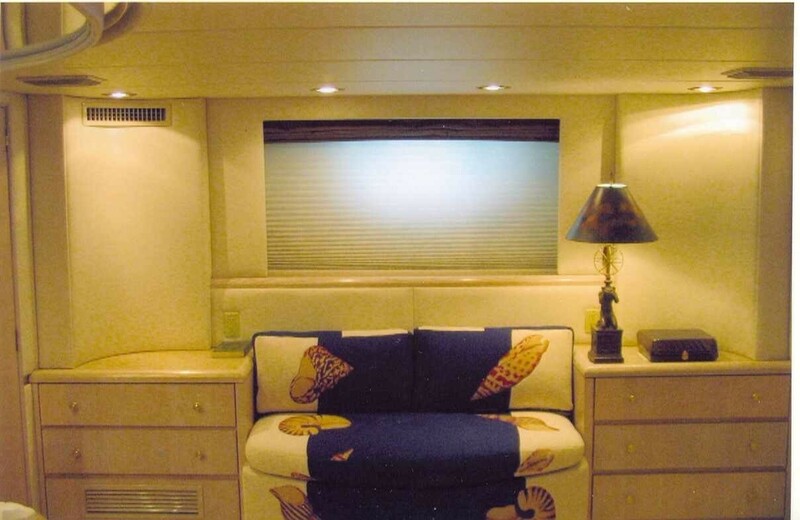 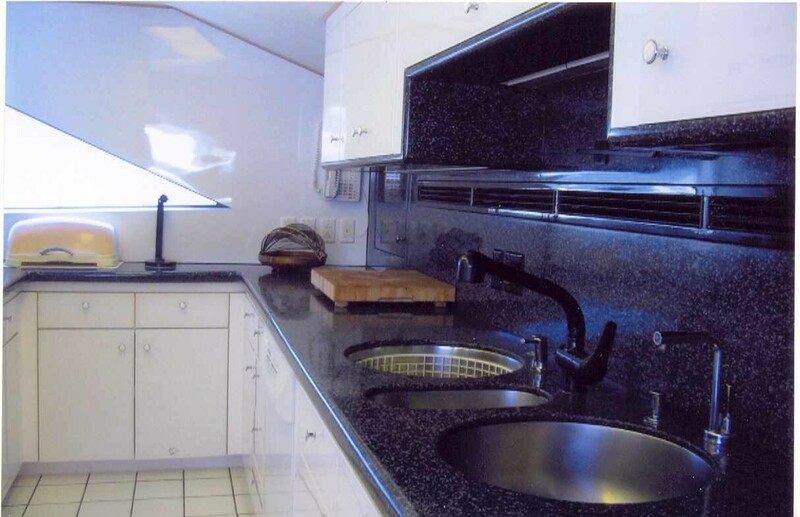 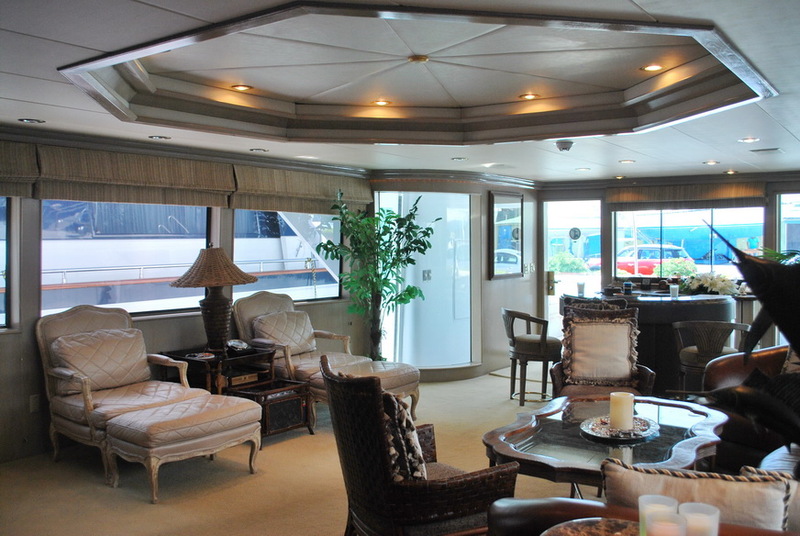 The GILAINE O motor yacht has a bespoke light interior décor. 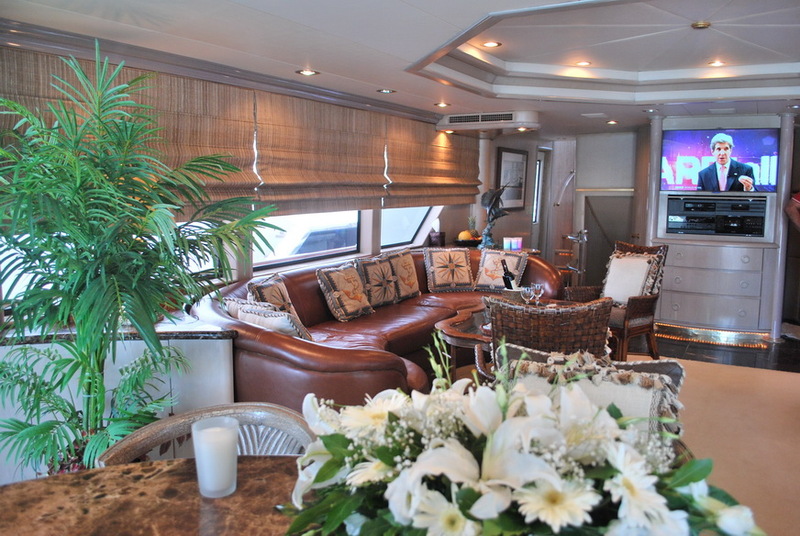 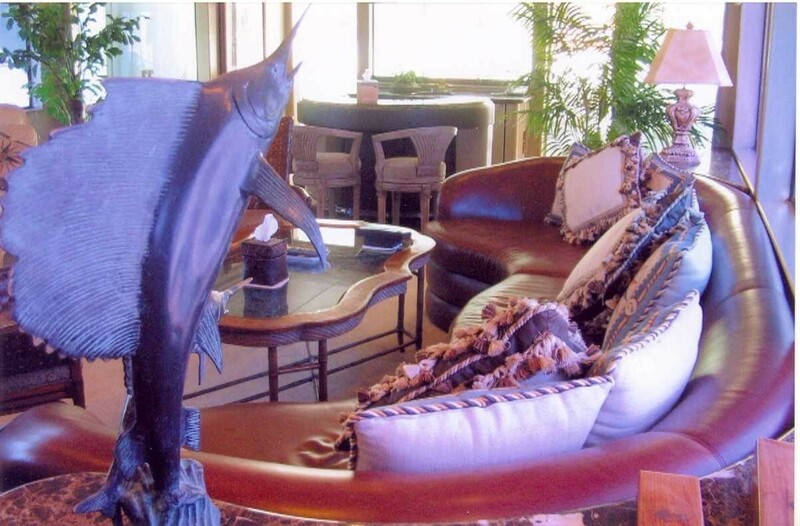 The salon and dining is an open plan, with the spacious lounge aft, including a U shaped leather sofa, coffee table, recliner chairs and a social wet bar. 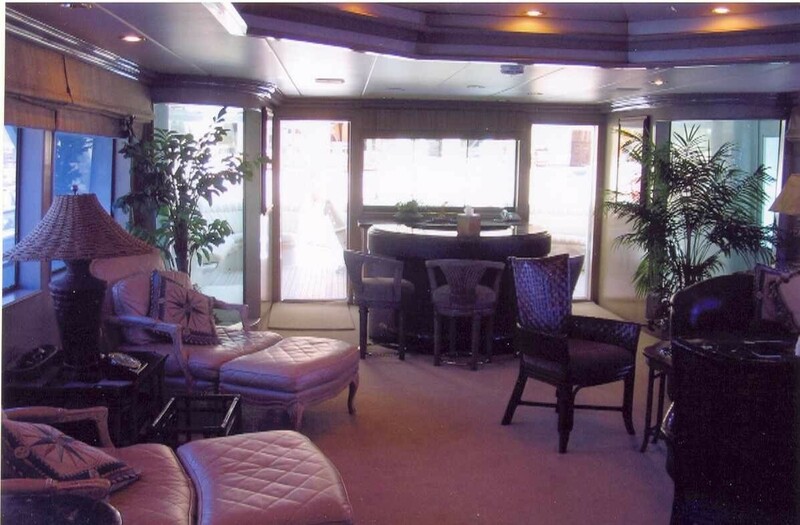 Forward of the salon lounge is the formal dining table, followed by a full entertainment area. 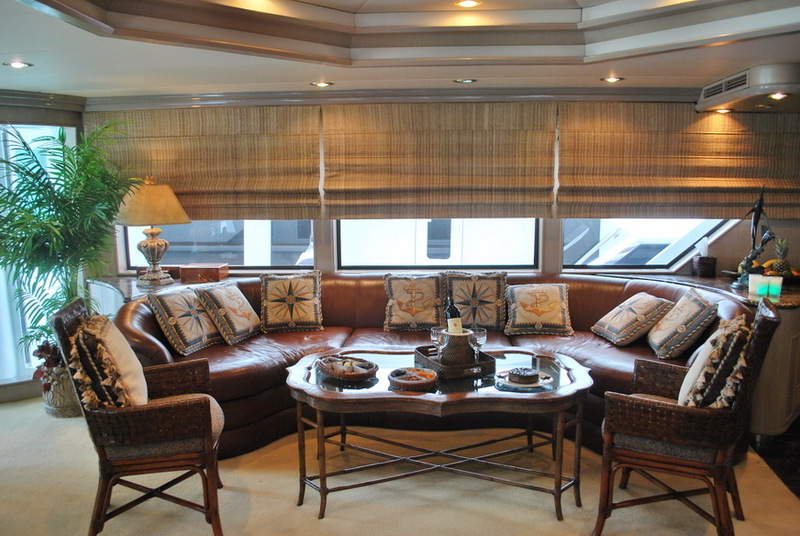 Panoramic windows provide plenty of natural light and scenic vistas. 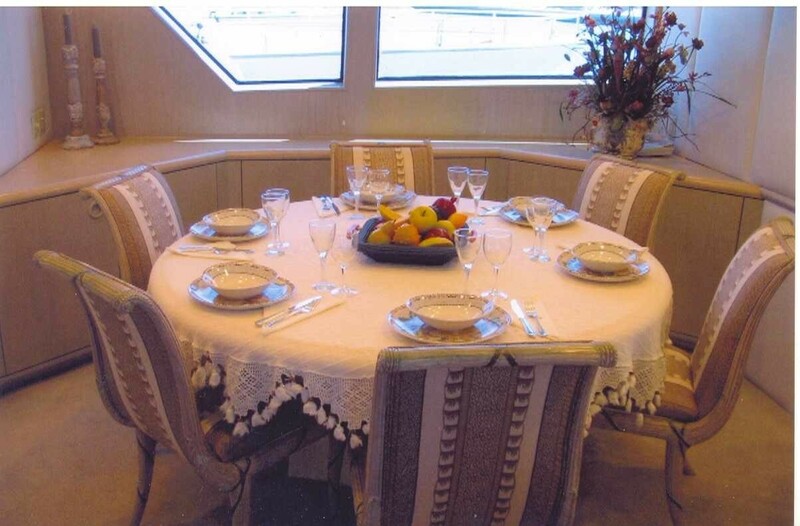 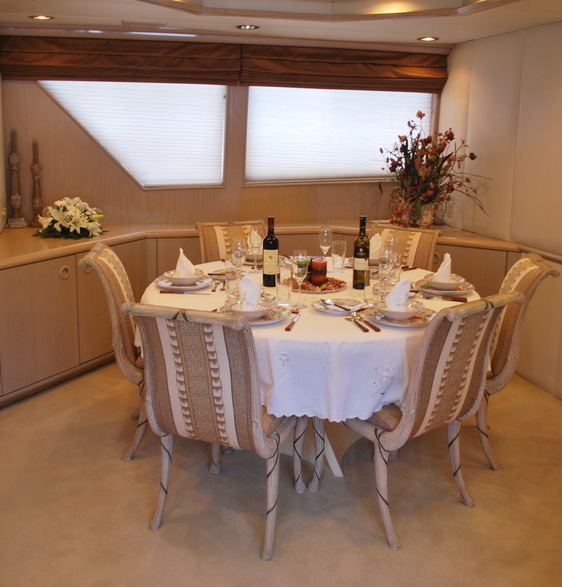 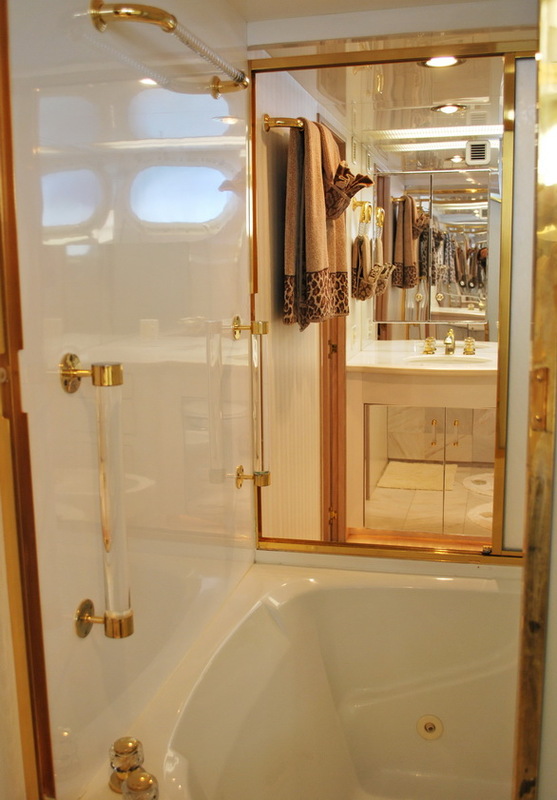 Below decks, charter yacht GILAINE O accommodates up to 8 guests in 4 en-suite cabins. 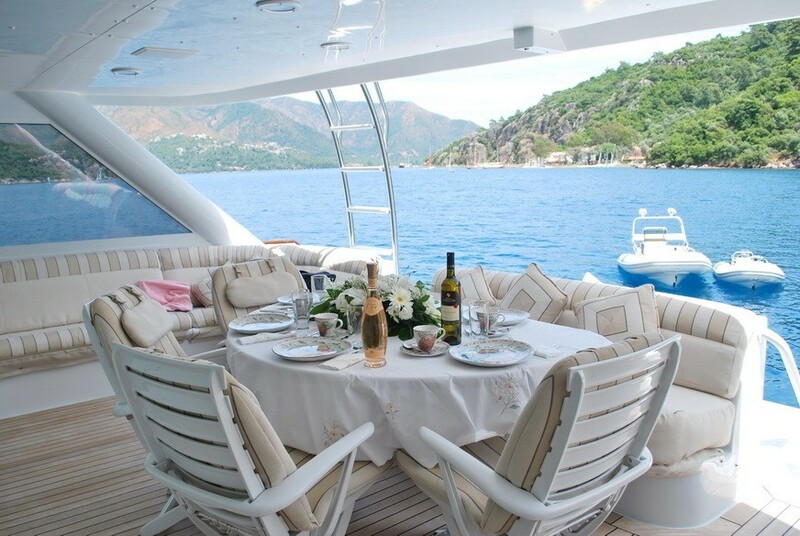 Motor yacht GILAINE O has ample exterior deck space on 2 levels, perfect for enjoying the East Mediterranean climate. 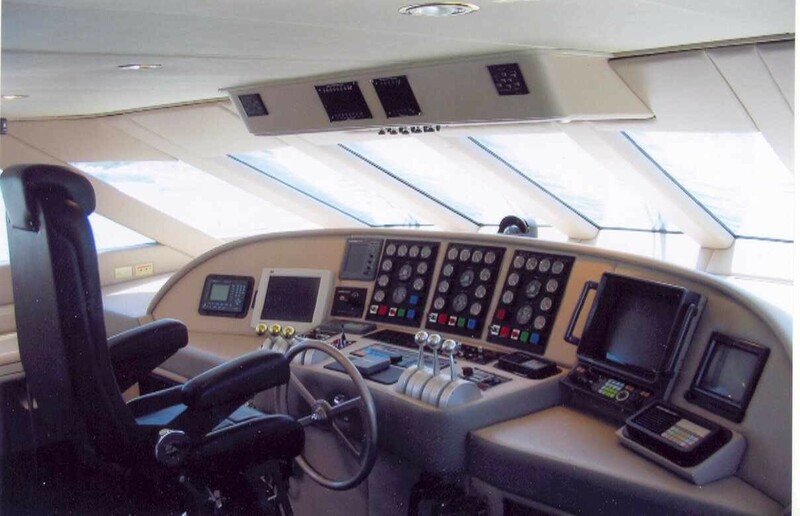 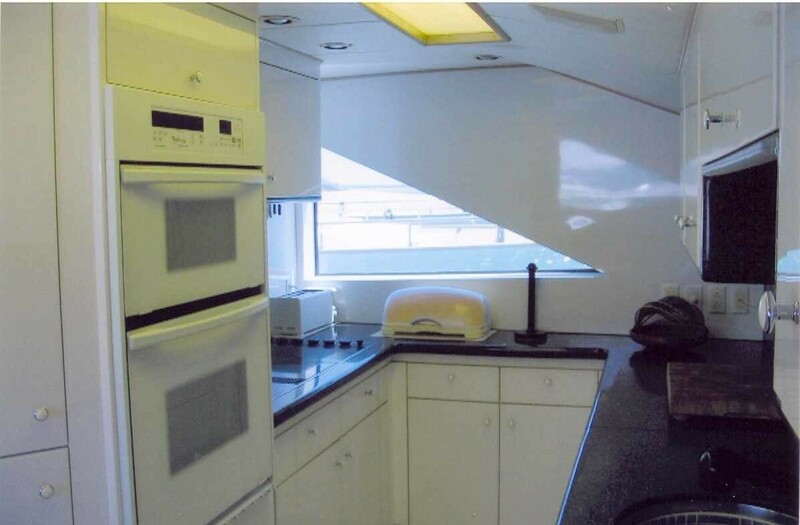 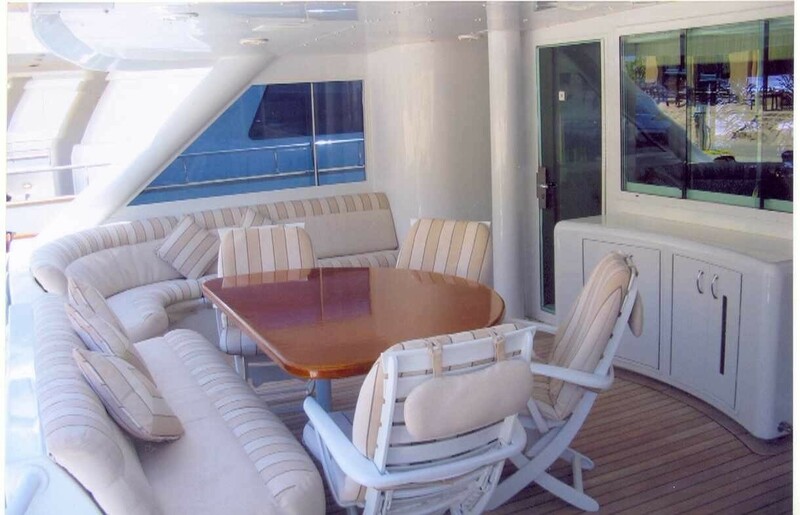 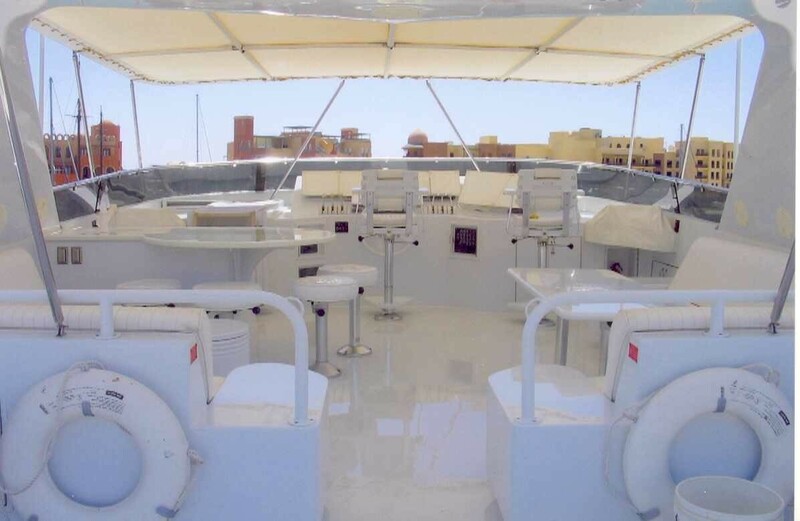 The main deck wraps around the yacht giving 360° access. 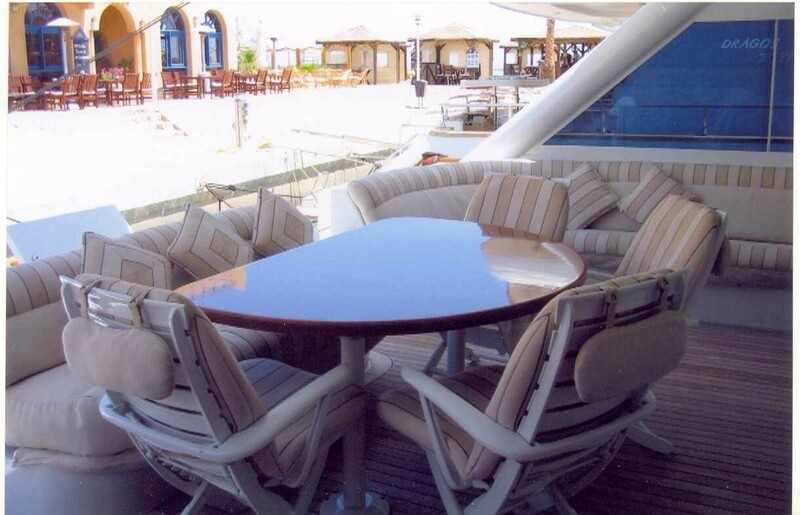 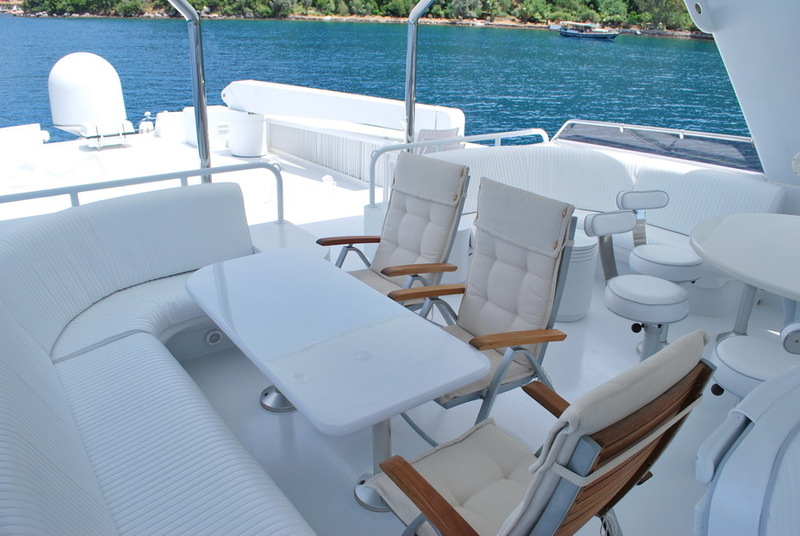 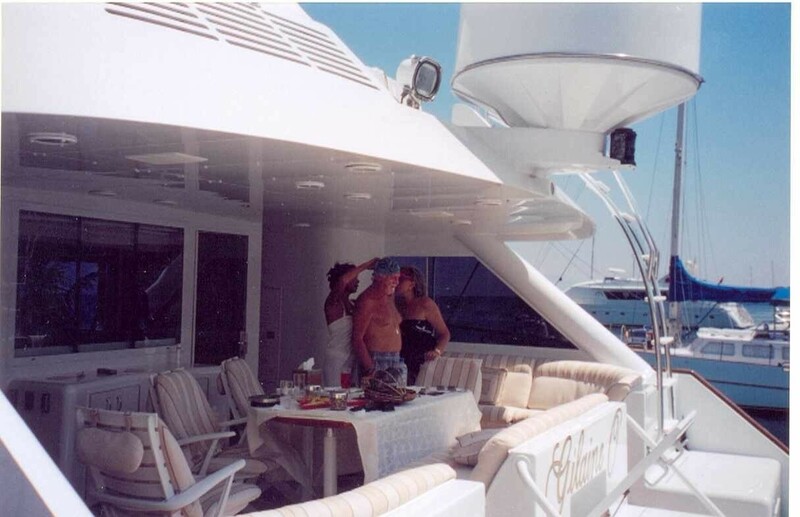 The aft deck is shaded and boasts an alfresco dining option and custom built upholstered seating. 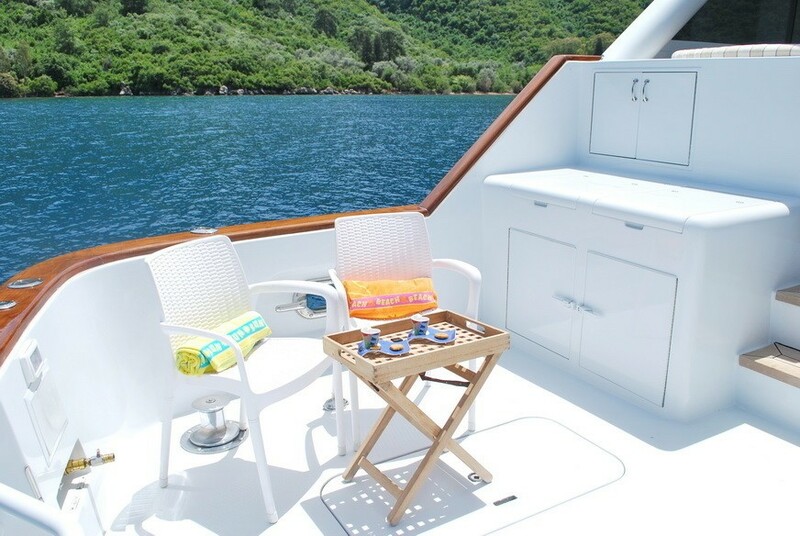 Further aft, a secondary aft deck is slightly lower and ideal for sunning, while offering effortless access to the extended swim platform and lowering boarding steps, perfect for water activities. 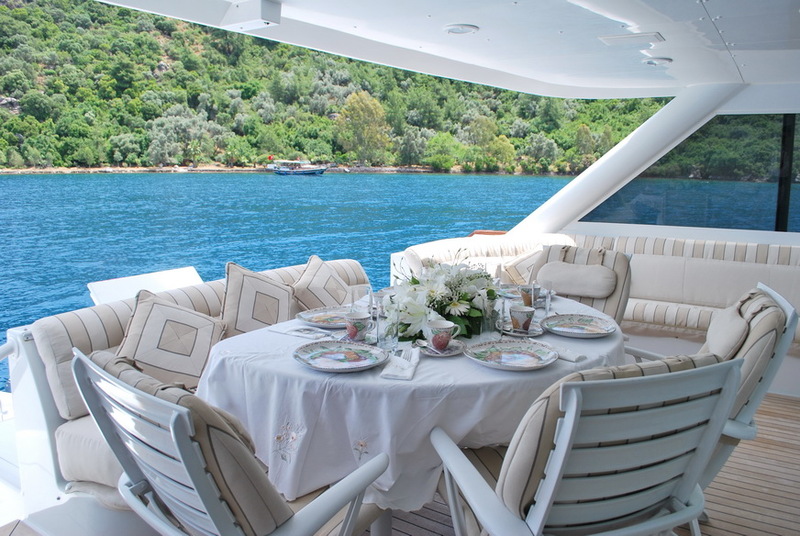 Above the main deck, GILAINE O boasts a large sundeck flybridge, complete with partial shade, seating and an alfresco dining table. 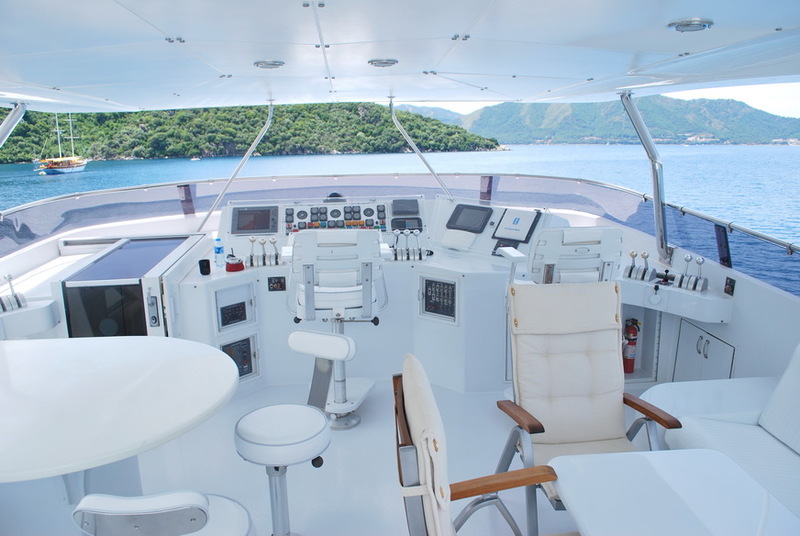 Powered by 1872hp engines, yacht GILAINE O cruises at 15 knots and can reach top speeds of 24 knots. 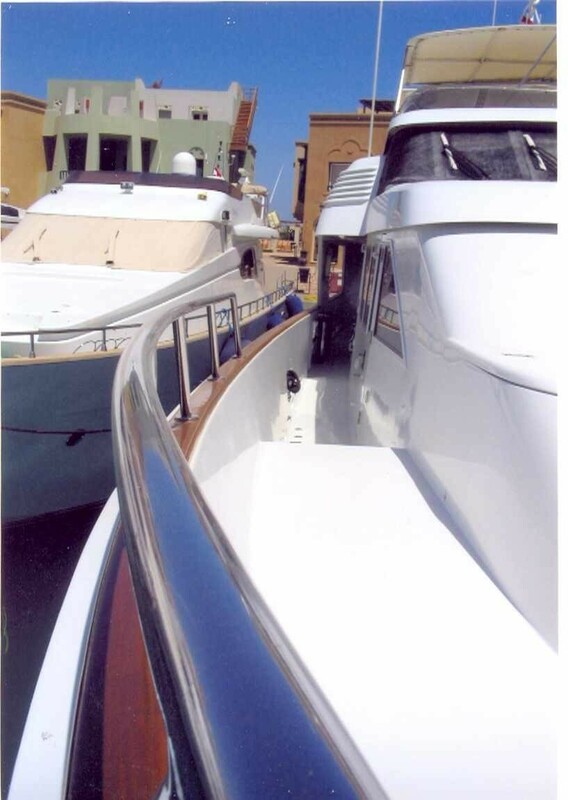 The yachts GRP hull is fitted with bow thrusters and stabilizers for maneuverability and comfort. 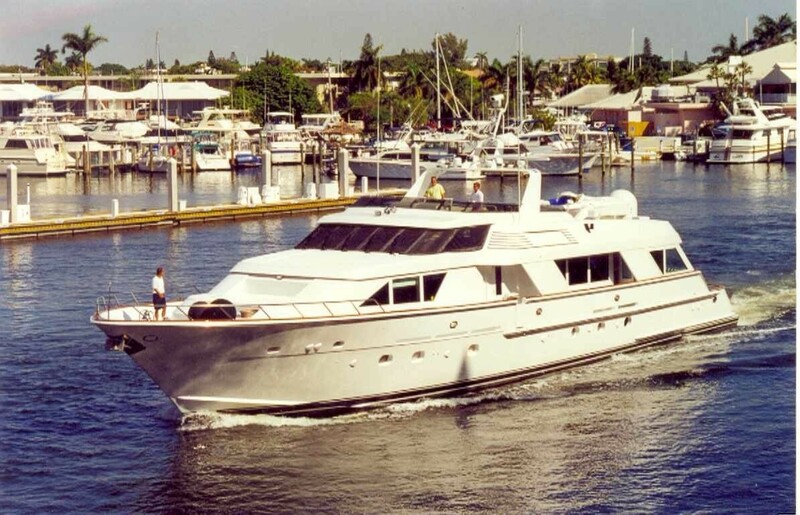 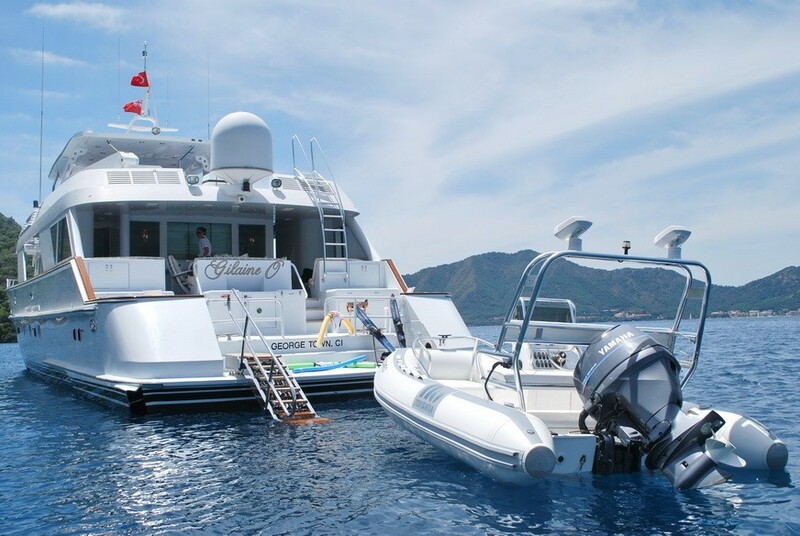 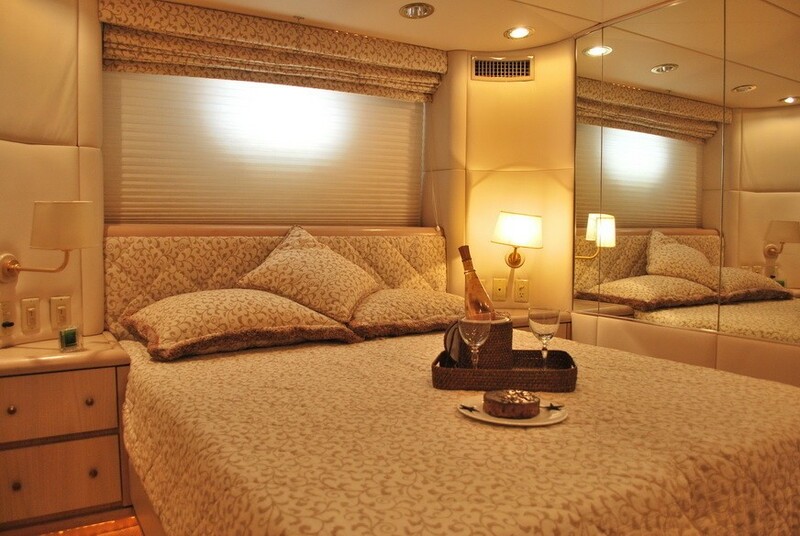 Luxury motor yacht GILAINE O can accommodate up to 8 guests in 4 en-suite cabins. 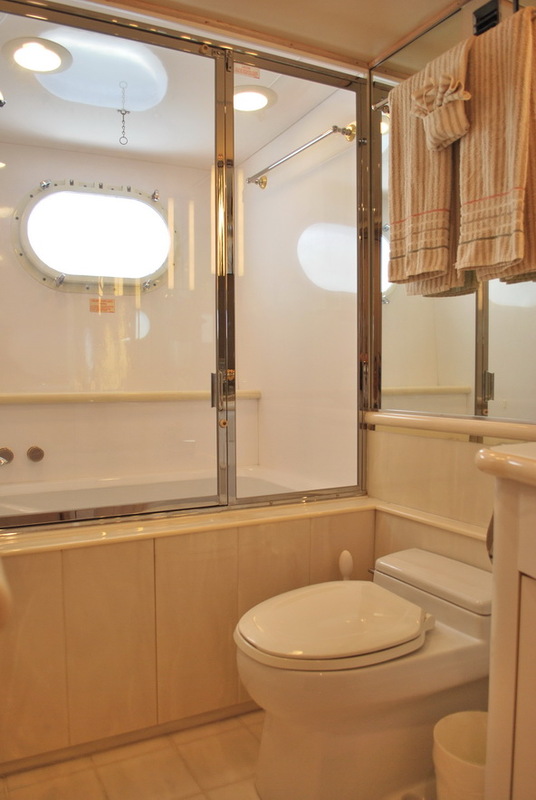 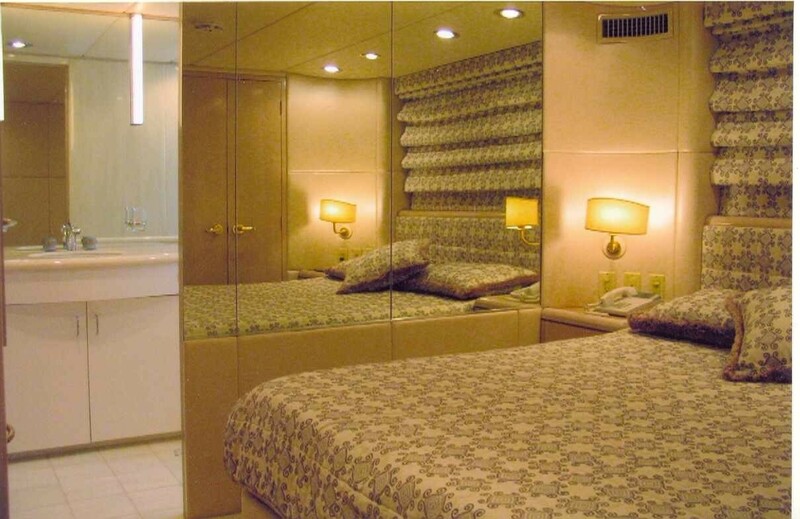 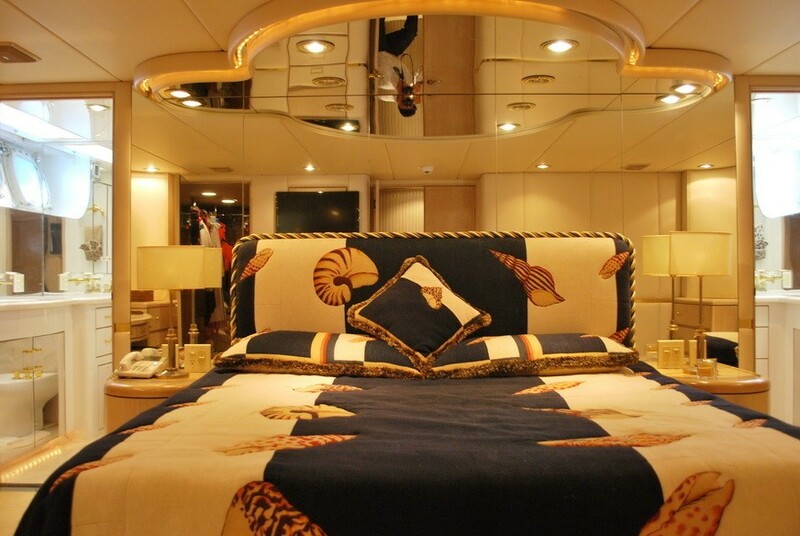 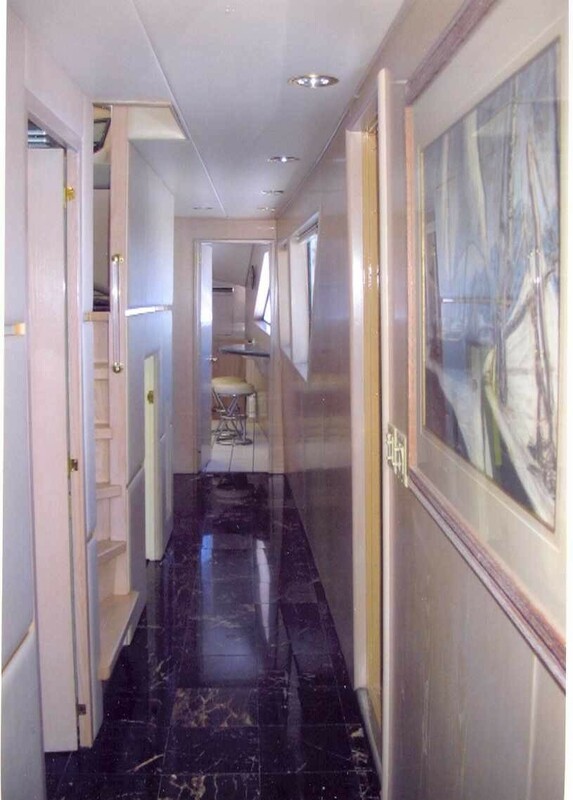 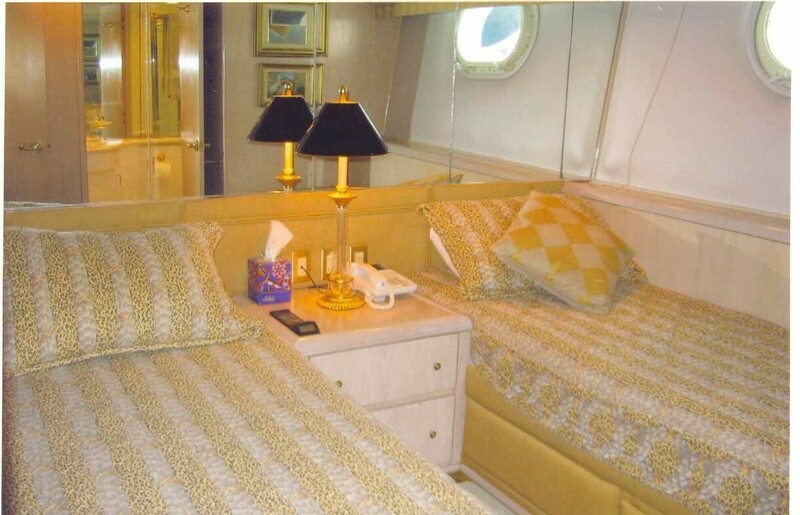 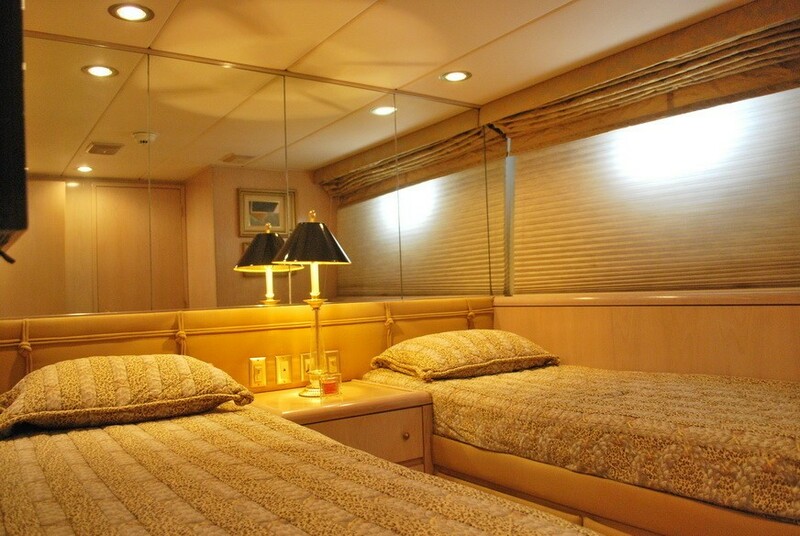 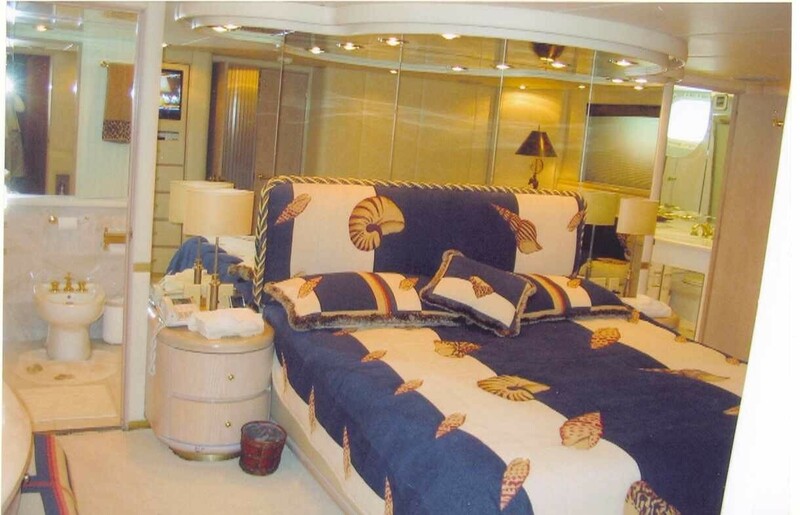 The master stateroom offers a king size center lined bed and is full beam of the yacht. 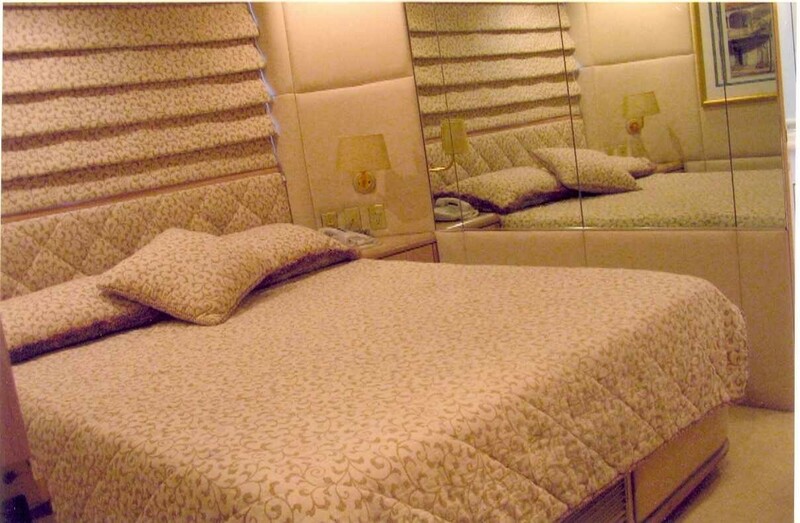 A guest double has a queen size walk around bed. 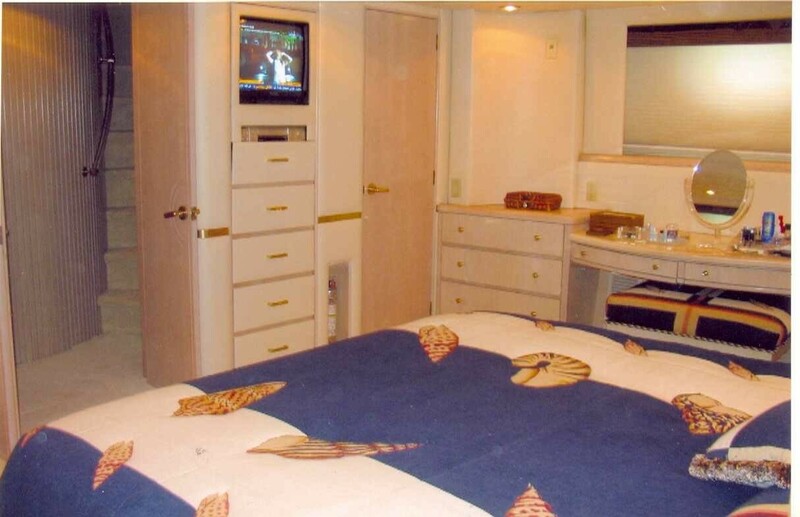 A further 2 guest cabins each have side by side single beds. 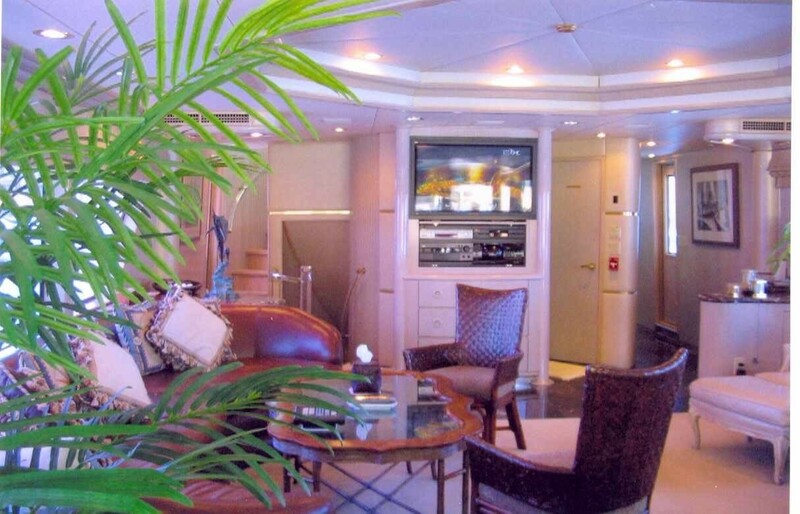 Each cabin features TV and DVD entertainment. 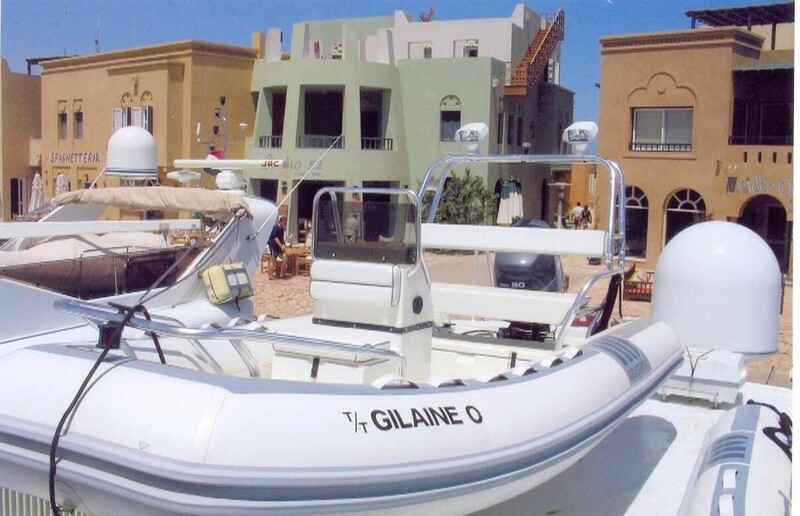 GILAINE O is fully air conditioned throughout.